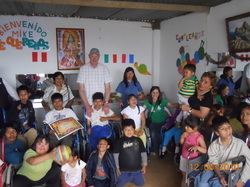 This is the orphanage that the church Camino de Vida has about 1 hour outside of Lima. There are about 40 kids there varying ages. I'll be visiting there again when I'm there. When I was there in May, a little boy (sitting on my lap) grabbed my hand when I got there, stayed with us while we were getting a tour (most of the other kids were off playing), and even introduced me to the 3 dogs they had on their property! Even though I was just there for a few hours, part of my heart was left there with all those kids who don't have a mom and dad to care for them. I'm looking forward to visiting with them again. These are two boys who live at the orphanage. 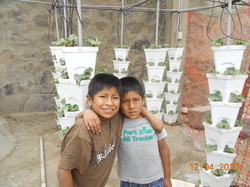 They are standing in front of their NEW hydroponic garden they recently received and started thanks to some wonderful donors! More hydroponic garden stuff. They currently have tomato plants and strawberry plants. 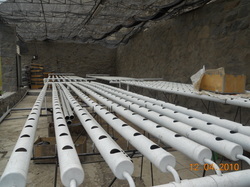 This type of growing is better because they can provide nutrients through the water system to help them grow better. The soil there is not very rich. This also provides the children with skills for farming and provides them with a free source of food. 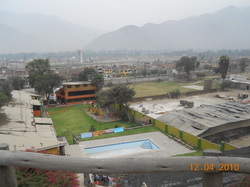 The view of the orphanage on top of the mountain! 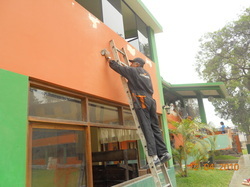 Before we started painting it white. 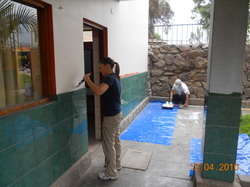 I went with a team of people to begin the painting process. 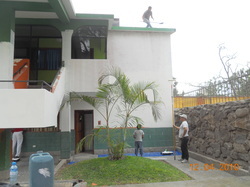 We were the first team to start this massive project, and other teams followed over the next 2 weeks. We needed many ladder holders because one guy who was up on a ladder had it slip out from under him and he fell about 10 feet and hit his head on the cement. Praise God he was ok! 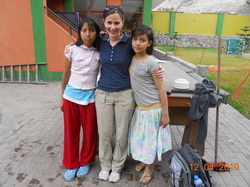 A few girls that live at the orphanage. They were so cute, they asked for my email. I hope they write to me! 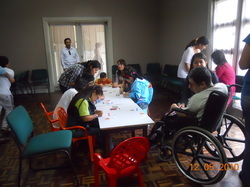 The 'Love Me' special needs sunday school at the church! I shared some suggestions for a few students. I hope that they will be useful to them. 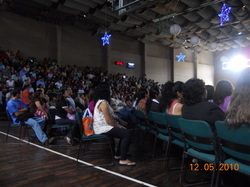 Worship service at Camino de Vida. 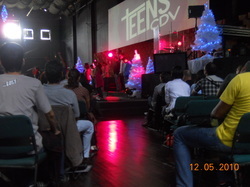 The teens were doing some skit to promote their summer camp! 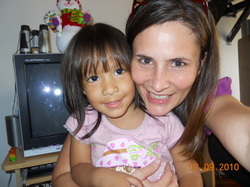 My dear friend Rebeca. 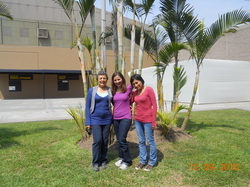 She works for the church and was with me a lot during my time there. 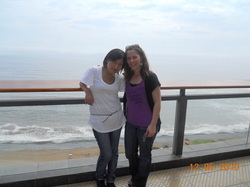 We spoke a little of each other's language and I think learned a lot more after our time together. Sunday after church she took me to the ocean for our lunch. This was the couple we visited one day. 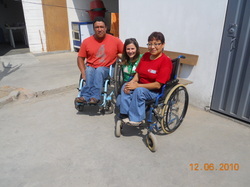 They both have polio and have received wheelchairs from free wheelchair mission. She makes the most beautiful cards out of bird feathers and then he takes them into town to sell them. He would like to be able to provide for her and not the other way around. But right now, there is no work that he is able to do. He is hoping to get a car that can be modified with hand controls so that he can be a taxi driver. They are in high demand in Lima because everyone takes them. This was at the rehabilitation center that I told you about. About the connection I had made about 2-3 months before this trip with this man via email! 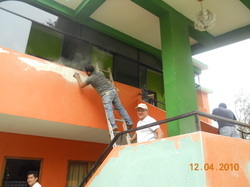 They are in the process of building a new center. I hope to help with some ideas for him since he really has no idea what to do regarding therapy. 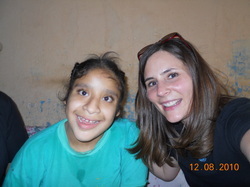 One of the girls who recieves therapy at the center. 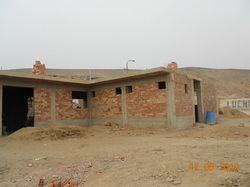 This is the outer structure of the new building for therapy in this area. 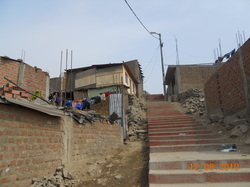 This place is about 1.4 hours away from Lima in a shanty town on the dirt mountain. 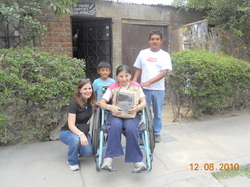 Maria, one of the women to recieve a wheelchair from Free Wheelchair Mission. Ajelandro, another recipent of the wheelchair. He has severe cerebral palsy. This family is very poor. 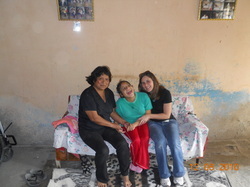 I shared their story with you in my blog. The view to go up to Ajelandro's home. 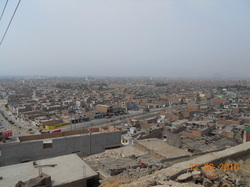 The view from Ajelandro's home. 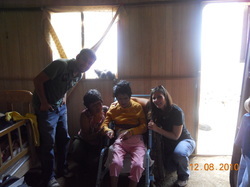 Maria, another person to receive a wheelchair. She is so strong though that she broke the harness. The family is trying to find a way to keep her safely in the chair so she can go places. She LOVED the camera! Stalin, my friend and interpreter the 2 days I went to visit people at their homes. 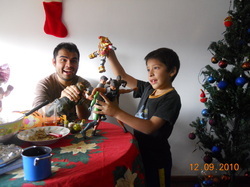 He is playing with Matais, part of my host family. Anaflavia, part of my host family. I love her! 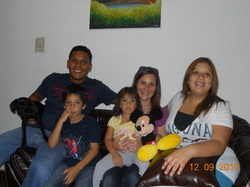 My host family! They are AWESOME! 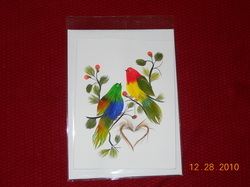 This is a sample of the cards that the woman I told you about that makes the cards out of bird feathers! All parts of this card are made of feathers. The picture does not do it justice!